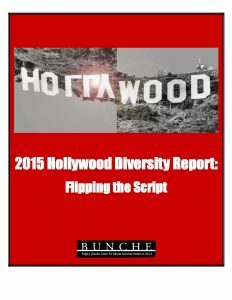 The Ralph J. Bunche Center for African American Studies at UCLA recently released “2015 Hollywood Diversity Report: Flipping the Script,” examines diversity — of the lack thereof — in the film and TV industries. Below are links to news coverage related to the new report. March 6, 2015 – Dr. Darnell Hunt, Bunche Center director talks with Roland Martin on “NewsOne Now” about diversity statistics in “liberal” Hollywood. To see the interview, Click Here. March 3, 2015 – AOL’s Latino Voices reports on findings in the Hollywood Diversity Report – Click Here. March 3, 2015 – Black Enterprise Magazine covers HBO’s diversity program, mentions new diversity report. Click Here. March 1, 2015 – MSNBC talks with Buzzfeed Senior Entertainment Editor on new UCLA study finding overwhelming homogeneity among Hollywood executives. Click Here. March 1, 2015 – Imperial Valley News reports on the disconnect between economic interests and business practices. Click Here. March 2, 2015 – Fusion.com examines the report findings, talks women in Hollywood numbers. Click Here. February 28, 2015 – NPR’s CodeSwitch highlights findings, – Diversity Sells — But Hollywood Remains Overwhelmingly White, Male. Click Here. February 28, 2015 – Indentities.Mic questions why Hollywood won’t embrace diversity even when it makes money. Click Here. February 27, 2015 – Campus Circle.com reports, “Hollywood Needs to Flip the Switch on Diversity.” Click Here. February 27, 2015 – Fortune Magazine questions why we need to talk differently about diversity. Click Here. February 27, 2015 – DSLRAFRICA.Com discusses Hollywood’s Africa Snub. Click Here. February 26, 2015 – Zócalo’s coverage of the panel discussion which features the Center’s report. To read the full article, Click Here. February 25, 2015 – The Hollywood Reporter provides exclusive coverage of the newly released report. February 25, 2015 – The Los Angeles Times features coverage of report findings. February 25, 2015 – Variety reports on the diversity report, discusses how audiences demand more diversity in film and TV. February 25, 2015 – Indiewire brings the report “Hot off the presses.” To read the blog, Click Here. February 25, 2015 – Breitbart.com features report findings on White male executives. 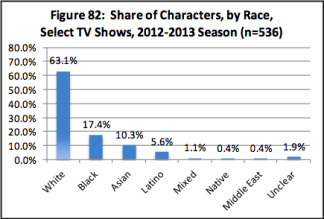 February 25, 2015 – KPCC’s The Frame reports the numbers behind Hollywood’s diversity problem. February 25, 2015 – IMDB.com covers release of the report. February 25, 2015 – The Daily Bruin highlights report findings. February 25, 2015 – UCLA Newsroom reports on the disconnect between economic interests and business practices in Hollywood. February 25, 2015 – Phys.Org discusses findings that women and minorities are still underrepresented among actors, directors and executives. February 25, 2015 – Zimbio.com breaks the news, diverse movies and TV make more money. February 23, 2015 – Washington Post writes about “Fixing Hollywood’s Diversity Problem.” To read the full article, Click Here. February 22, 2015 – Time.com features the stories that diverse thought-shapers want to see. February 20, 2015 – The Los Angeles Times published an op-ed piece citing the lack of racial diversity, particularly of Latinos and Asians, in Hollywood. To read the full article, Click Here. To DOWNLOAD the “2015 Hollywood Diversity Report: Flipping the Script,” CLICK HERE. For background information about the Bunche Center’s Race and Hollywood Project, Click Here. For previous posts about the Center’s Hollywood Advancement Project, Click Here. To learn more about supporting this important research project and its annual diversity report, please contact Chia Yen, Executive Director of Development, UCLA Institute of American Cultures at cyen@support.ucla.edu or 310.206.6872. To learn more about how to support the Bunche Center, you may also visit https://giving.ucla.edu/bunche. They should be chosen by their acting talent and ability NOT skin color. Doesn’t matter if actors are white or black. Will Smith, Martin Lawrence, Denzel Washington are a few of many excellent actors. I’m tired of these actors being marginalized by people complaining that not enough Blacks are chosen. Other actors need to fight for roles and work hard just like the actors listed above. Please read our report, which explains why the issue of underrepresentation is an important one that has little to do with acting ability.